Looking for hard-to-match historical window styles and colors? Investigate today's strong, long-lasting vinyl windows. You'll find the perfect match in double-hung, sliding, jalousie, divided, casement, or bay (garden) windows constructed of durable vinyl that holds up year-after-year to rugged use and extreme weather. 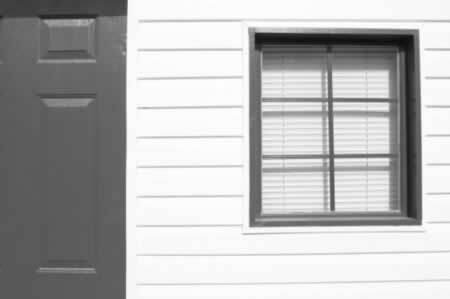 This simple, six-lite window provides just the right contrast to the home siding and matches the entry door to a tee. Double-paned glass boosts your energy efficiency, adding value to your home while decreasing your heating and cooling bills. With expert installation, you'll receive a tight-fitting set of windows that are secure and clean up easily with mild detergents and water. Attractive, strong, and virtually care-free: can these be the perfect new or replacement windows for your home?